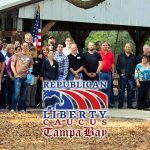 The Republican Liberty Caucus of Tampa Bay works hard to promote limited government, individual liberty, and free markets in the Tampa Bay area. Your generous contributions are invaluable to our efforts. Please give what you can. We can now take automatic recurring contributions. If you can afford to skip a latte or two per month, please consider a small recurring donation.